And lo, first there came forth the cute Cat picture, asking Can I Has Cheezeburger?, and it ruled the Internets with billions of page views. And now it comes to pass that the Internet has finally collapsed underneath LOLcat control. 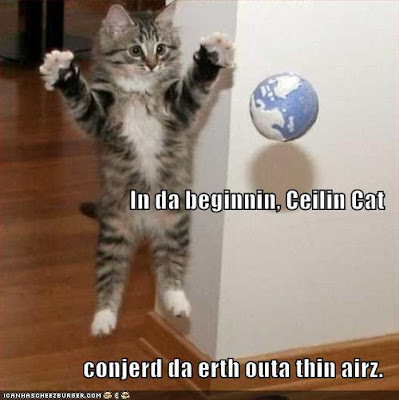 See the LOLcat Bible Translation. "Oh hai. In teh beginnin Ceiling Cat maded teh skiez An da Urfs, but he did not eated dem." I wonder if other federal agencies will follow the lead of FCC's Kevin Martin. Martin (apparently in a decision he hid from his own agency) decided to plop down $350,000 to plaster a car driven by David Gilliland with stickers to promote the 2009 switchover to Digital TV. The result: not one, but two crashes during NASCAR races, the second causing a 9-car pile-up. Talk about a political plan gone up in smoke.
" ... the cars that are in wrecks get a lot of attention, I think they get a lot of attention during the race itself." He's set to race again with the FCC logo, though no word yet if he plans to plaster a FEMA Mobile Homes Are Safe sticker, or maybe a Palin In 2012 sticker. Talk radio is bad for you, makes you feel bad about yourself, and success depends on a show's ability to make you angry and miserable. "To succeed, a talk show host must perpetuate the notion that his or her listeners are victims, and the host is the vehicle by which they can become empowered. The host frames virtually every issue in us-versus-them terms. There has to be a bad guy against whom the host will emphatically defend those loyal listeners." "This is a common talk show tactic: If you lack compelling arguments in favor of your candidate or point of view, attack the other side. These attacks often rely on two key rhetorical devices, which I call You Know What Would Happen If and The Preemptive Strike. Using the first strategy, a host will describe something a liberal has said or done that conservatives disagree with, but for which the liberal has not been widely criticized, and then say, “You know what would happen if a conservative had said (or done) that? He (or she) would have been filleted by the ‘liberal media.’ ” This is particularly effective because it’s a two-fer, simultaneously reinforcing the notion that conservatives are victims and that “liberals” are the enemy. The second strategy, The Preemptive Strike, is used when a host knows that news reflecting poorly on conservative dogma is about to break or become more widespread." "This brings us to perhaps the most ironic thing about most talk show hosts. Though they may savage politicians and others they oppose, they fear criticism or critiques of any kind. They can dish it out, but they can’t take it." Take the above as a sort of follow-up to yesterday's post. The TN Republican Majority - Now What? With typical disconnected and racially-charged perspectives - a normal tactic from Tennessee GOP Spokesmodel Bill Hobbs - there appears now an odd claim that state voters appeared in droves during last week's election to soundly reject crazy liberal Democrats in the state legislature, yet another example of ignoring reality and fabricating political upheaval. -- The Senate battle between Faulk (R) and Williams (I) was a nasty one, loaded with bizarre mudslinging efforts regarding Faulk's dalliance with a staff worker and that Gov. Bredesen and Republican Tony Shipley stumped for Williams - and the finally vote tally showed Faulk with a win of just a few hundred votes, even though Williams won the day in 4 of six counties. Not really a mandate there ... is there? The web sites were headed by Scott Glimmer, who is an aide to TN House Republican Chairman Glen Casada. So far, no actions taken against Casada and he may instead get a celebratory dinner from the GOP. Here's some simple truths - the state's Democrats had been hard hit with charges stemming from corruption claims via a FBI investigation in recent years; incumbent Democrat Governor Phil Bredesen is on the way out, offering little support for the Obama campaign, and doing very little to throw support to statewide races, and the general disorganization from state party leaders. Oh, and just about every political observer was hoping that at long last Democrat House Speaker Jimmy Naifeh would finally get the boot, something I have been in favor of for many years. However, here in Hamblen County, McCain won by a huge margin - yet incumbent Democrat State Rep. John Litz won with almost as many votes as McCain earned. Lots of split-ticket voting shows that in even in such a staunch Republican stronghold, Democrats can obviously do well. The new Republican majority in the Legislature says they are eying legislation to change laws regarding "cultural issues". Wait, isn't that some of that Evil Democrat Social Engineering?? Tops on the GOP agenda for new legislation - restricting abortion, funding education about pregnancy prevention, and expanding gun ownership laws. How will any of that aid the plummeting economic problems and falling educational achievement and funding or the constant decline in the state's revenues? "I think it is safe to say that not much that will cost much money is going to move that far. I expect that leaves 140 years of lost freedom and lack of personal responsibility issues to sort out. Will it be all that conservative?? I would like to think we will be as conservative as the other side has been liberal or allowed liberalism take control of our state. I have no idea what the heck he is even talking about -- what is the "140 years" of hellish disarray he is talking about? Didn't Dems take the Speaker's post back in 1971?
" ... my point is, now is the time for the Republicans to put their butts on the line for “Life.” Banning abortion doesn’t cost you anything. It’s a feel-good measure that makes it look like you’ve accomplished something, but it doesn’t require you to sacrifice or make any tough decisions. I challenge you, Republicans: If you’re really pro-life and about protecting the babies, bring down the infant mortality rates in this state." Do You Want The News Without Viewpoint? Everyone seems to be super-paranoid about something called media bias, a nagging fear that somehow all the information we get via newspapers and television media has turned into a cesspool of sneering and sly distortion with some nefarious agenda meant to push us into heinous beliefs. Is this a new concept? Reason magazine has a story about these media worries, citing a 2007 Pew Research report which says that 67% of Americans "prefer to get news that has no particular point of view". The language here is so deceptive - the fact is that 67% of people who took the survey responded as reported, and that really isn't 67% of Americans. And how can news even have "no particular point of view"? "[This] is a revelation that must have come as a surprise to Rush Limbaugh, Michael Moore, Bill O’Reilly, Keith Olbermann, Matt Drudge, and all the other industry innovators who’ve enjoyed such great success delivering exactly the opposite." "At the nonprofit NewsTrust.net, users collectively evaluate stories based on fairness, context, and other core journalistic principles; the highest-rated stories receive the most prominent positioning on the NewsTrust.net home page. At Skewz.com, users simply judge each story in terms of bias: Does it have a conservative slant or a liberal slant? Over time, Skewz.com uses the feedback from its users to determine a media outlet’s general position on various issues. For example, according to Skewz.com users, the English version of the Al Jazeera website skews “slight right” in its 2008 election coverage. Then there’s SpinSpotter. The brainchild of Todd Herman, a Seattle entrepreneur with a background in Internet radio and streaming media, the SpinSpotter browser plug-in lets you visit virtually any website and hack it up like Tina Brown channeling Freddy Krueger. Find a specific phrase or sentence that fails to pass your spin sniff test, then create a SpinSpotter “marker” for it. When other SpinSpotter users visit the page, a crimson slash of warning highlights the passage. A click on it yields your explanation for why it qualifies as spin and your version of how the text ought to read. To keep users on track, SpinSpotter has designated “seven deadly spins” that are fair game for media bloodhounds. I've been noticing - and have been totally repulsed by - some recent choices on the CNN network to make news a sort of free-wheeling, Jerry Springer-type opinion brawl on news reports which seem to have little purpose beyond stirring up intense conversation based on a bare minimum of information.
" ... uses the day's most powerful headlines as a starting point for diverse perspectives and spirited debate. In each show, Galanos challenges newsmakers and experts to help viewers gain a clearer understanding of the "right vs. wrong" conflict playing out across the country every day." Yeah, right. That's one way to put it. But the actual show is mostly a circus of half-truths and maybes which offer no context of any kind and merely trot out events to be torn apart like slaves in a Roman coliseum full of starving tigers. Nancy Grace is also just a skeezy game for armchair prosecutors hurling crap on a wall and waiting to see what sticks (and what generates viewer frenzies). Shows like these are the lowest end of the low end. It all seems geared to one end: gaining popularity in order to make more advertising dollars. I honestly don't mind that a persistent viewpoint is given in news reports or on those talk shows. While readers and viewers are passive receivers (at first) then follows (hopefully) some actual thought -- opinion is offered but it's actual value has to be determined by those who receive it. A news report or talk show is not some Holy Form handed down from the Perfection of Heaven. Truth these days is perceived in the most ludicrous of emails ("Microsoft will pay you to send email" or "Obama is the Antichrist!") -- which makes me think of the old traveling snake oil sales shows. A crowd usually gathers around such spectacles, although in the past, that same crowd might just decided to tar and feather the salesman and run them out of town. Some crowds, however, gulp down dubious elixirs and cheer the salesman as saint. -- alternate report: Final Days of Bush Presidency and Everything Must Go Sale!! - come on, times are really tough, so why not turn this into a Depression-era-style Dance Marathon, where the celebs must dance around the clock until they all drop from exhaustion, then the winner is able to qualify for a federal bailout plan. - It's Alive! It's Aliiiiiive!! SEE ALSO: Great Headline Writing - Not! The sculpture you see here is by Tony Dow, who is known worldwide for playing Wally, brother to The Beaver, on the old "Leave It To Beaver" TV show. Tony's work has also just been selected for a show at the Louvre in Paris. No, I'm not "giving you the business" about that. Here's the news. 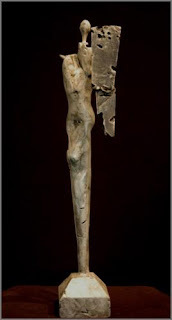 The image shown is of the sculpture which will greet the Paris art world, called "Unnamed Warrior". "My sculpture derives from whatever has passed through or by me; a culmination of my experiences; what I’ve seen, what I’m drawn to. The figures are abstract and not meant to represent reality but rather the truth of the interactions as I see and feel them. I find the wood in he hills of Topanga Canyon and each piece evolves from my subconscious." I like his view about creativity and art - all of us construct our lives from all the bits and pieces we experience and generate through just living life. And there's something kind of cool about Wally - sorry, I mean Tony - getting a showing in Paris. Another artist, photographer William Eggleston, who has called Memphis, Tennessee home for many many years has just opened a massive retrospective show, titled "Democratic Camera", at the Whitney Museum of American Art in New York. For the last 40 years he has created a prolific collection of photos which truly changed the art world and the way the art of photography is defined. The Memphis Commerical Appeal did a story recently about Eggleston which is a great read. 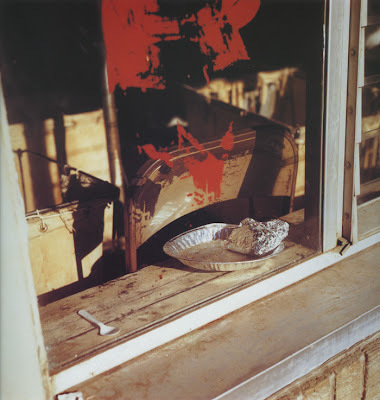 Eggleston is rather humble about his work, but for me the way he uses color and composition, line and form, captured in some very ordinary but extraordinary images of the everyday world is so simple and so profound all at once. One major change he gave to the art world was the notion that it was OK to use color in photography. And he captures images of the world without really arranging items or posing them, taking them as they are instead. You will seldom see people in his photos, but every image is something made or abandoned or used by people, as if it were taken in just that moment when someone left or just before they arrived. His influence is huge - just go browse through the tens of thousands of images people have created and uploaded to the Flickr website. "He has photographed every tell-tale thing we leave behind us, from leaking oil to spilled Coca-Cola. He has looked up and caught the emanations of the Great Smoky Mountains, and a mist very like a ghost that appears to be drifting over a graveyard and near Oxford, Mississippi. In photographing ivy crowding over a wall, in commotion as lively as a townful of Breughel peasants, he has got a picture of a country breeze. He moves his camera close upon a great worldly peony; our glimpse into that is as good as a visit: a bloom so full-open and spacious that we could all but enter it, sit down inside and be served tea. It was photographed, according to the caption, on the Boston Common across from the Ritz Hotel--which is the next thing to photographing an analogy." Explore his work at his website, EgglestonTrust.Com. While the chattering cable news folk jabber about the fact that a meeting is taking place today between the current and the next president, one fact stands out -- the advice Obama is likely to get first and foremost from President Bush is "pick your rug carefully". "I'd bet just about anything that it's the first thing Bush talks about when Obama enters the room." As for what's taking the priority in Obama's mind - rolling back not just the rug, but the policies of the last 8 years. In the last few months, shocking and sudden shooting attacks have taken place in a church and a mall in Knoxville. On Sunday, as reported in this Knoxville News Sentinel article, a group of teens and adults held a vigil at the Knoxville Center Mall to raise awareness about gun violence and to mourn and memorialize the victims. An organizer and speaker at Sunday's event was a 14 year old girl named Sumaiya Hussain, and for me she stands as a pretty courageous and articulate person. Taking a very public position such as they did is no easy task - they open themselves to all manner of reactions. But I certainly respect their desire to counter violent episodes with expressions of peace and a call for greater harmony. And yes, you can say both events were exercises in "freedom of speech", the mall vigil was far more valuable to the community. The sidewalk display offered little of value, other than offering folks a chance to eyeball some people with dubious character. It would serve Knoxville and the state much better if more focus were placed on events like the one at the mall. Kudos to the KNS for making the vigil a page one story. "Every dog has it's day and a good dog might just have two."